The other day, I was going through my jewelry box and I found a ring, not just any kind of ring. I found the ring my father gave me on my wedding day. And because I belive behind every heirloom there is a story, I decided to share mine with you today. My parents custom ordered three rings (identical) with their daughters’ initials (two of them happened to be their own initials as well) to give to us girls on our wedding day. I have my father’s ring – because we share initials (E is for Eduart and Edvana – although most of you know me by Vana). There is a comforting feeling I get each time I wear this ring. It makes me proud of who I am and where I came from and well, reminds me of my sweet father who I miss so very much (my family happened to live on the other side of the ocean…sigh*). My father wore this ring for 25 years of his life and the day I got married he placed it on my finger. I can’t begin telling you how I felt that very moment. It was like my life, my whole life, flashed in front of me – small bits of tender memories, people, places, faces, stories…they all came to me in such a short moment in time – and in all that I truly realized the meaning of this ring. My wish is to do the same one day with the same gratitude my father had the day of my wedding. Do you have a similar story? Were you given something with a deep meaning? If so, leave it on the comment area below. I’d love to read it!! 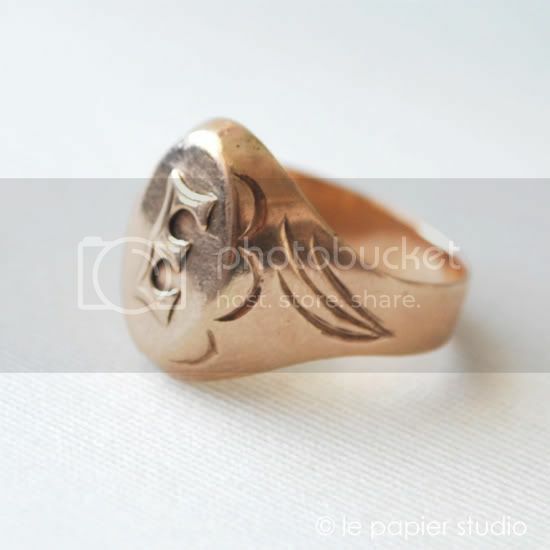 The post My Father’s Ring appeared first on Le Papier Blog.